The upcoming General Election is set to be a very important one. Which Political Party will be getting your vote? 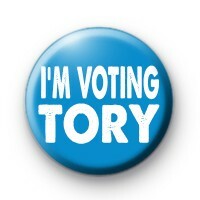 If you are supporting Theresa May then you need this I'm Voting TORY badge. Our 1 inch badges are a great way of showing your voting intention. We have quite a few Pro Conservative badges in the shop so make sure you check them out.